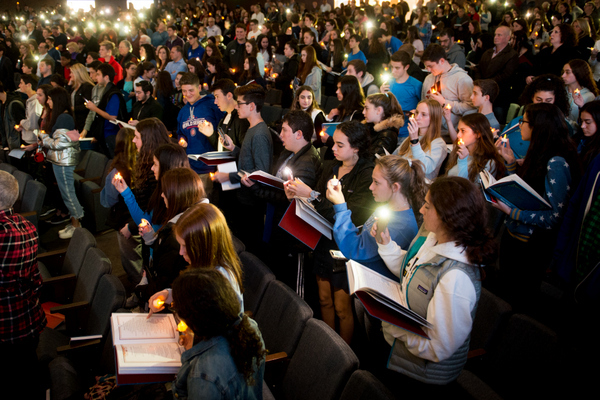 Lights fill the room during the light vigil portion of a memorial service at Temple Israel in West Bloomfield Twp. on Monday, Oct. 29, 2018. The service was quickly organized by local Jewish youth groups in response to the anti-Semitic mass shooting at a Pittsburgh synagogue on Saturday. 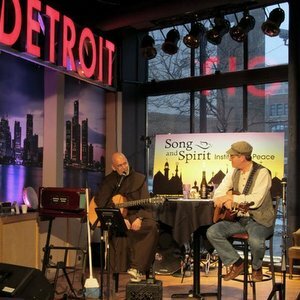 Since its founding eight years ago, the Song and Spirit Institute for Peace has brought together people of various faith traditions working collaboratively in any number of creative ways. Br. Al Mascia, OFM, and Hazzan Steve Klaper of Song & Spirit Institute for Peace. From making art to making music to caring for the poor and homeless of Detroit; this ministry has always chosen to focus on what it is we have in common rather than on our differences. You might say its mission, simply put, is bringing people together! Sometimes, however, what brings people together turns out to be the worst nightmare come true. Such was the case when, on Saturday, October 27th, while Sabbath morning services were being held, eleven worshippers were murdered by a lone assailant at the Tree of Life synagogue in Pittsburgh, PA; the deadliest attack on Jews in American history. Here in Detroit the news spread like wildfire and soon friends and allies of Song and Spirit were connecting with the wider Jewish community, coming together with them to grieve, to mourn, to console, to heal. I attended two synagogue services the week following the shooting. 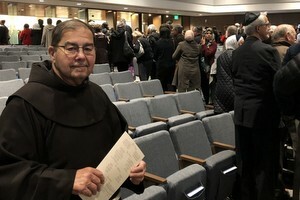 At one, the largest Reform congregation in the country, a Christian choir sang songs like Shalom Chaverim in the temple lobby as people entered the sanctuary where there was standing room only. Watch the video below. The service was called a Shabbat of Solidarity. There was more music, praying, preaching, poetry as well as the opening of the Ark to expose the congregations’ many Torah scrolls, for Jews the real presence of God. 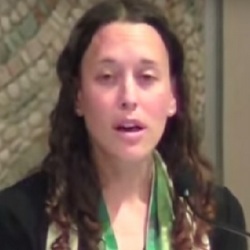 At one point, a young rabbi, Jennifer Lader, stood on the bimah before this massive assembly, preaching from the very depths of her being. “Is this to be the new normal?” she asked, her voice strong and compelling. “Are we to evermore live in fear and dread?” Silence, as her voice echoed throughout the dwarfing sanctuary. As Fr. Mike Lenz and I, both wearing our Franciscan habits, slowly made our way from the sanctuary to the parking lot we were stopped by countless members of this Jewish congregation. Some hugged us, some shook our hands, every one of them looked into our eyes while thanking us for being there. It means so much, we heard time and time again. Please, come back. As I write this article there is breaking news of yet another mass shooting, this time in California. This time twelve, young human beings, also made in the image and likeness of God, have been killed by another lone assailant. And I can’t help but wonder, what is it that we’ve lost as a people? What critical piece of our human makeup has gone missing resulting in such tragedies, drawing us ever deeper into a world of fear and dread and tempting us even to despair? Losing our keys, wallet or beloved keepsake is concerning, to be sure, but when what has been lost just happens to be a virtue like hope, charity or justice, then we all need to pray for its immediate recovery! 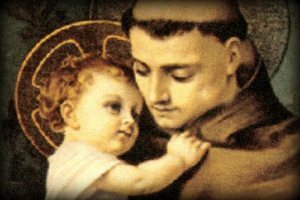 St. Anthony, glorious servant of God, famous for your merits and powerful miracles, help us to find what was lost. Give us your help in times of temptations; and enlighten our minds in searching the will of God. Help us to find again the life of grace, which our sin destroyed, and lead us to the possession of the glory promised us by the Savior. Amen.